In addition to the usual stress associated with the holidays, the TSA is out today predicting a very hectic travel week in what is already considered to be the busiest week of the year for planes, trains, and automobiles. Whether or not the TSA's prediction comes to fruition, in that agency's infinite wisdom, remains to be seen. But armed with that knowledge and given the general positive tone of the economy it behooves us to look at airline stocks, especially with oil's recent slide not hurting input costs, either. Some major airlines like AAL DAL UAL are mixed, as AAL has been the notable laggard to United's stunningly bullish action this autumn. And DAL is coming on now, too. Meanwhile, LUV and JBLU have been decidedly mediocre with their price action. But SkyWest seems to be perennially overlooked. The regional airline headquartered in St. George, Utah, has ties to all the major airlines, of course, in terms of collaborating on connecting flights. And you can imagine that will become even more pronounced during Thanksgiving travel. 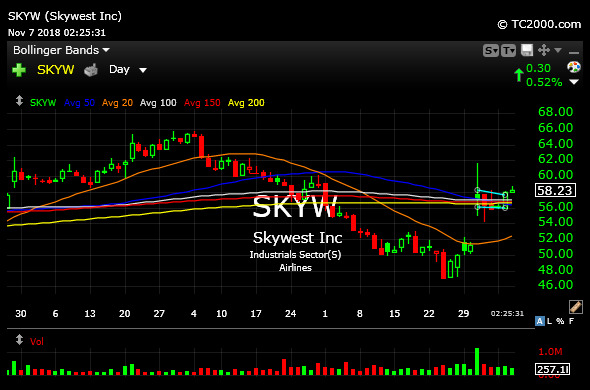 On the SKYW daily chart, below, we have a tight flag above a cluster of moving averages and the key $56 level. This is a tight long setup, especially if the stock can push over $59 anytime soon. ALK is another potential long worth watching into today's gap up, too. But SKYW seems to be in prime position for Thanksgiving this year.